Want some free Southwest drink coupons to enjoy a glass of wine, cocktail or beer on your next flight? Unfortunately, drinks are not free on Southwest Airlines (alcohol costs $6-$7 per drink), but there ARE ways you can score a freebie, and it doesn’t require you to have earned any rewards. If you are not yet a member (and you should be if you want to learn how to fly free on Southwest! ), join the Southwest frequent flyer program, which is called Rapid Rewards. Sign up at Southwest.com. Southwest sometimes sends Rapid Rewards members free coupons in the mail after they have flown a set number of flights (the rumor is 10 one-ways in a calendar year). You’ll see the image above shows a letter I received with four coupons, which appears to be because I am a Rapid Rewards member. Did you know there’s a way you can always bring someone with you FREE on Southwest? It’s called the Southwest Companion Pass! 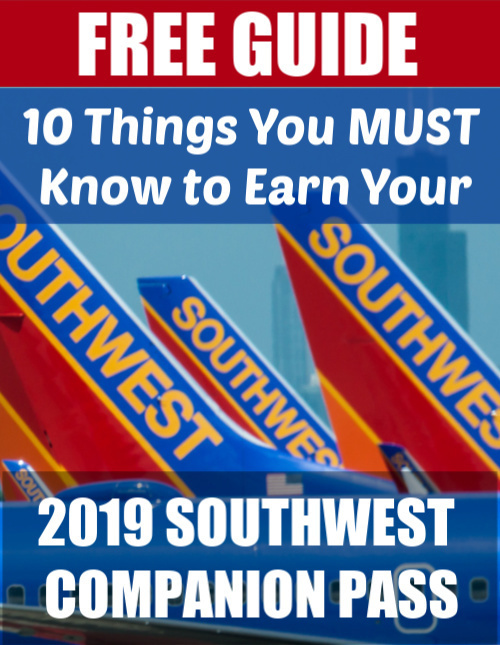 Enroll in my online course, “How to Earn Your 2019 Southwest Companion Pass … Step by Step” and I’ll walk you through how to easily earn your own Companion Pass for this year and beyond. It comes complete with step-by-step checklists, case studies, roadmaps and everything you need to get your pass quickly and cheaply! This is also key if you want to fly free on Southwest. To earn the coveted Southwest Companion Pass, which lets one person fly free with you up to two years (and which I show you how to do step-by-step in my free downloadable guide), you’ll need at least two of Southwest’s travel credit cards (to support the Go to Travel Gal blog, please consider applying for the cards using the Travel Credit Cards link in the main Menu Bar). These cards offer big bonuses when meeting a minimum spend, which count toward the 110,000 Southwest points you will need to earn the Southwest Companion Pass. Credit card holders often get free drink tickets as thanks for being a card holder. Plus, your Southwest points never expire as a card holder! On my second anniversary of holding the Southwest Rapid Rewards Chase Business Premier card, Southwest sent me four free drink coupons in the mail. Hooray! Log in to your Rapid Rewards account at Southwest.com. Click on My Account (top right). Scroll down to My Preferences/Travel. By ensuring you are receiving all Southwest email communications, you’ll increase your chances of getting these coupons. Sometimes they’ll offer a freebie in one of their emails, plus you’ll also find out about their sales. You can also check the latest Southwest sale on Go to Travel Gal’s Southwest sale page. On some special occasions, like Mother’s Day, St. Patrick’s Day and Halloween, they give away free drinks … if you know to ask for them! You’ll find out in the Southwest enewsletter or by reading Go to Travel Gal  (make sure you have signed up to receive my enewsletter in the lefthand sidebar!). They usually include it on their current drink menu in your seat pocket, as well. Ensure you are signed up for Southwest emails by logging into your Rapid Rewards Account at Southwest.com, clicking My Account, then Preferences/Communication. Ensure all boxes are checked. Business Select tickets cost more, but they do throw in a free drink each direction. When you buy a Business Select fare, you earn 12 Southwest points per dollar versus 6 points per dollar versus Southwest Airlines Wanna Get Away Fares (the cheapest Southwest fares). You will get your printable drink coupon when you check in at the airport. It will be on the end of your Business Class boarding pass, so don’t lose it! Here is a good forum post from the Southwest Airlines Community site that discusses free drink coupons. Learn how easy it is to fly free on Southwest by downloading my free step-by-step guide below. St. Roc sparkling wine and Cran Apple – I recently tried this one and it’s super yummy!! Here is the full Southwest inflight menu, including Southwest Airlines beverages. There are a variety of ways you can score free Southwest drink coupons, so you can toast your travels without spending a dime! They include signing up for Rapid Rewards, holding a Southwest Rapid Rewards credit card, purchasing a Southwest Business Select fare and signing up for Southwest email communications. Have you found other ways to get free drink coupons? I’ve received a similar set of coupons for the past two years, so I’m looking for them in the mail now, thanks! I guess they are for being a card holder? Ah, maybe that’s it! Hope you get them too! I’ve never received SW drink coupons. Although I hold 2 SW CC and fly them (for free) 6 – 8 time a year. And have the companion pass. I guess they feel like they are giving me enough for free. I’m not complaining.